Although technology dictates that we now receive many of our bills or banking information via the Internet, much of the information we receive still comes through the post - in fact it's often used as an additional security measure. For the most part, sending mail through the post is quite safe, but those intent on stealing information will use the post as a means of getting hold of our personal details. Here we look at the best course of action to take if you feel you have been the subject of mail theft. Those of us responsible for looking after household bills will have a reasonably good idea as to when certain bills arrive. We can normally judge to within a few days when bills, if sent by post will arrive, especially if they have corresponding direct debit in place. Most utility companies send bills to inform us how much the bill will be and on what date the money will be taken from our bank account - in this case, the bill is simply for your records. However although the bill is simply being produced and sent to you as means of notification, it's produced in the same way as a bill that requires prompt payment. The bill may therefore contain payment information, possibly including information on existing bank accounts - personal details which are sought by the typical mail theft criminal. Make a list of your utility bill due dates and if a bill – or number of bills – have not arrived within a few days of their due dates then contact your utility provider. This may sound perhaps a little contrived but it's important to ensure that when your postman arrives with your post, they are able to put it through your letterbox. It's not uncommon – especially on streets where the houses have no gardens – to see items of mail sticking out through letterboxes. This is a prime example of how an identity thief can get access to your mail without you knowing. Make sure that there is nothing obstructing your letterbox and that your letterbox is oiled regularly. Likewise putting a small sticker in a front door window asking that all mail is properly pushed through is no bad thing. If you are not there when a special delivery item such as a recorded delivery letter is delivered your postman will leave a card detailing how and when you can collect the item. 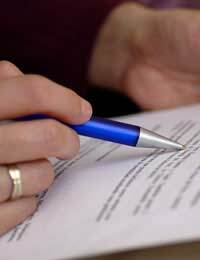 If you know there is an item being delivered that requires a signature ask a trustworthy neighbour to sign for you. Also if you are going on holiday then perhaps asking a family member, close friend or trusted neighbour to regularly pop in and remove any mail from the letterbox or floor behind the front door is worthwhile. This reduces the chance of an opportunist seeing evidence that the house is unattended. Can a Notice of Correction Protect Against I.D Theft? Is Identity Theft Insurance Just a Scam? What is Identity Theft Fraud Alert?